Olive (Olea europaea L.) is considered drought tolerant and trees can survive on shallow soils with little supplemental water beyond winter rainfall. However, olive fruit production and the economic survival of the orchard operation does not depend solely on tree survival. In table olive production, maximum fruit size and fruit yield must be maintained, while in olive oil production, oil yield and quality must be maximized if an orchard is to remain economically viable. 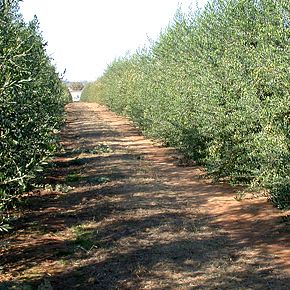 Adequate water is critical to maintaining orchard productivity since olive is extremely responsive to irrigation in terms of maximizing shoot growth, fruit size, and fruit yield, and oil yield per acre. Before any sort of regulated deficit drought irrigation strategy can be managed the timing and amount of what constitutes full olive irrigation must be understood. Water is lost from an olive orchard to both evaporation and transpiration (the combination of which is referred to as evapotranspiration, or ET). ET is affected by a myriad of factors, including humidity, temperature, wind, solar radiation (day length), and the percent canopy cover (the percentage of ground shaded by trees). Reference evapotranspiration (ETo) is based on the ET of a reference grass crop. To acquire real time ETo data, visit the Department of Water Resources California Irrigation Management Information System website: www.cimis.water.ca.gov. You'll note that the ETo in figure 1 below is driven by both day length and temperature and is highest in July followed closely by June and August. Fig. 1. Average monthly reference evapotranspiration (ETo). Source: Beede and Goldhamer, 2005. Crop water use of mature olives (ETc) is determined by multiplying the reference ETo by the olive crop coefficient (Kc) of 0.75 (Goldhamer, 1994). The resulting average water requirements of olive trees at full ETc can be met by a combination of rainfall and irrigation. Olive crop water use ETc in a clean cultivated orchard or where weeds are completely controlled follows in Table 1. Table 1. Olive crop water use (Etc) when fully irrigated and clean cultivated. Increasing the amount of water applied beyond full olive ET showed little to no increase in yield (yield components including shoot growth, bloom, fruit size, fruit load, and oil content). Altering the Kc used in irrigation scheduling also did little to increase the value of the fruit, and thus the overall revenues collected. Goldhamer's study (Goldhamer, 1994) showed that table olives perform best under these optimal conditions, but will survive extremely water-stressed conditions, as they are naturally drought tolerant trees. Full ETc is reached once canopy cover exceeds 50% of the orchard surface. In young orchards with less than 50% canopy cover, crop water use will be reduced but not by the amount of the cover reduction. Increased reflection from the soil surface and advective heat from unshaded areas between rows increases young tree water use. If canopy cover is less than 50%, water use is estimated to be twice what the canopy cover percentage would suggest. For example, 10% cover would mean multiplying full ETc by 0.2 (or 20%), 30% cover means multiplying full ETc by 0.6. Maximizing fruit size and fruit yield are key components of table olive production that must be maintained if an orchard is to remain economically viable. 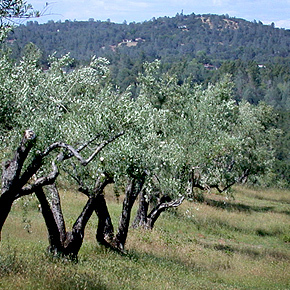 After establishing the Kc for olives, Goldhamer went on to research olive trees' reactions to various levels of water stress imposed as regulated deficit irrigation (Goldhamer, 1999). A regulated deficit irrigation regime at several levels of water reduction is outlined in Table 2. When water was cut by 50% from June 1st to August 15th (Moderate Deficit Irrigation - Table 2) up to nearly 21% of the season's water requirement was saved. Fruit growth slowed during the regulated deficit but accelerated upon return to full irrigation. This irrigation strategy led to no differences in gross fresh fruit yield, fruit size, or gross revenue when this mild to moderate regulated deficit irrigation approach was employed over four years. This olive regulated deficit irrigation strategy can save water while maintaining good yield of high quality fruit, but you must have good control of your water applications and know what you're doing. Table 2. Regulated deficit irrigation applications: a controlled stress. The severe regulated deficit irrigation regime (Table 2) saved nearly 40% of the olive water requirement but resulted in a 10% yield reduction and a 25% reduction in gross revenue due to a substantial increase in smaller fruit sizes. Since olive is extremely responsive to irrigation in terms of maximizing shoot growth, fruit size, and yield, adequate water is critical to maintain orchard productivity and economic sustainability. If limited water supplies require that olive irrigation be cut back by 40 to 70 percent of ETc, then it is no longer feasible to produce table olives. The only alternative may be to produce olives for oil. The economics of olive oil production in a table olive orchard is difficult at best and it is not likely to be economically sustainable in the long term. See the following section on optimum irrigation for olive oil production. Irrigation management has a profound influence on olive oil production and on olive oil quality but with some flexibility over a rather broad range of water applications below full ETc. Since the price received for olive oil is not related to fruit size, oil olives can be irrigated less than table olives and still produce good olive oil. 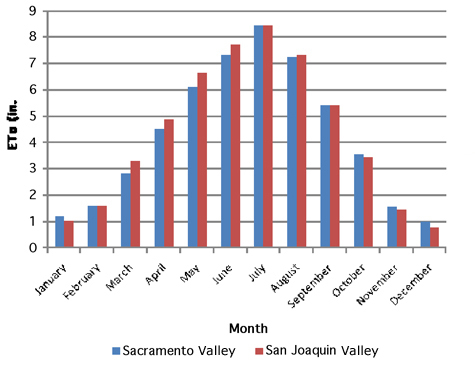 A comparative study evaluating the influence of seven different levels of water applied by drip irrigation to 'Arbequina I-18' olive trees grown in a super high density orchard (670 trees per acre) in the Sacramento Valley of California was conducted in the early 2000's (Grattan et al, 2006). Full ETc was met in the Spring by annual rainfall and a fully recharged soil profile until the irrigation season began in late April to early May. The reduced percentages of ETc applied were imposed during the irrigation season from roughly May to October at which time seasonal rainfall once again began to contribute to ETc demands in all treatments prior to harvest. Similar to table olives, oil olive trees show reduced vegetative growth and have smaller fruit size as the percentage of ETc is reduced. Since oil olives are grown in hedgerows where small tree size must be maintained once the trees are mature (filled their space), discouraging excessively vigorous growth by controlling water is a desirable result. Fruits per branch, fruits per inflorescence, fruit density, and fruit set were all increased as applied water increased up to 71-89% ETc. Fruit retention was unaffected by irrigation treatment. Olive fruit weight increased as water applications increased with fruit yield approaching a maximum at about 71% ETc. Trees with higher irrigation levels were first to show color changes in fruit maturity but once fruits on water stressed trees began to mature they did so at a much faster rate. The percentage of olive oil extracted from fruit decreased in a linear fashion at three of four harvest dates as the amount of applied water was increased. The reduction in oil extraction with increased applied water was somewhat offset by increased fruit yield. Hence, total oil yield per tree reached a maximum at 70-75% ETc (Fig. 2) but was optimized over a rather broad range. A companion study on oil quality measured fruitiness, bitterness and pungency of oils produced at various levels of water stress. Results showed that stressing olives to between 33 and 40% ETc produced oils that had a better balance of pungency and bitterness, were pleasantly fruity, held both ripe and green character, had more complexity and depth, and boasted higher polyphenol content. High levels of irrigation lowered oil extractability and produced bland oils with significantly less fruitiness and almost no bitterness or pungency. Trees under the greatest water stress produced oils with excessive bitterness, very high pungency, and woody herbaceous flavors. Although all irrigation treatments produced oils of "extra virgin" quality, oil chemical and sensory characteristics indicate that intermediate irrigation (33-40% ETc) provided the best overall balance in oil quality (Berenguer et al, 2006). Fig. 2. Figure 2. Total olive oil production per tree is optimized roughly between 40 and 70% ETc. Source: Grattan et al, 2006. Excellent olive oil yield can still be achieved when in-season deficit irrigation is held at 70% ETc or a 30% reduction compared to full olive ETc. At this level of irrigation, olives for canning experience significant reductions in fruit size and in subsequent grower returns. If severe drought water shortages are experienced and water is only supplied at 40% of ETc, olive oil quality can still be maintained but oil yield will begin to suffer. This 60% reduction in applied water compared to full ETc can still produce good quality olive oil but the oil yield at this level of irrigation is not economically sustainable for ongoing production. Irrigation reductions to levels below 30% ETc (a 70% cut back) will result in very low oil yield as well as poorer quality oil. This level of water availability begins to approach dry land farming, a situation in California that is not economically sustainable. Based on the most recent oil olive irrigation research, optimum irrigation for producing olive oil ranges between the 33-40% ETc that maximizes olive oil quality and the 70-75% ETc that maximizes olive oil production. Hartmann, H.T., Panetsos, C. 1961. Effect of soil moisture deficiency during floral development on fruitfulness in the olive. Proc. Amer. Soc. Hort. Sci., 78: 209-217. Goldhamer, D.A., J. Dunai, and L. Ferguson. 1993. 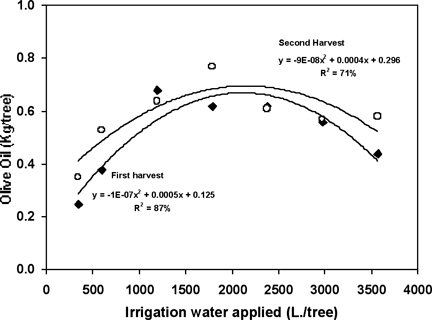 Water use requirements of Manzanillo olives and responses to sustained deficit irrigation. Acta Horticulturae 335: 365-371. Goldhamer, D. A. , J. Dunai, and L. Ferguson. 1994. Irrigation requirements of olive trees and responses to sustained deficit irrigation. Acta Horticulturae 356: 172-176. Metheney, P. D., L. Ferguson, D. A. Goldhamer and J. Dunai. 1994. Effects of irrigation on Manzanillo olive flowering and shoot growth. Acta Horticulturae 356: 168-171. Beede, R. H. and D. A. Goldhamer. 2005. Olive irrigation management. In: Olive Production Manual, Second Edition, G. S. Sibbett and L. Ferguson, eds. University of California Publication 3353. pp. 61-69. Goldhamer, D. A. 1999. Regulated deficit irrigation for California canning olives. Acta Horticulturae 474(1): 369-372. Grattan, S.R., M.J. Berenguer, J.H. Connell, V.S. Polito and P.M. Vossen. 2006. Olive oil production as influenced by different quantities of applied water. Agric. Water Mang. 85 (1-2): 133-140. Berenguer, M.J., P.M. Vossen, S.R. Grattan, J.H. Connell, and V. S. Polito. 2006. Tree irrigation levels for optimum chemical and sensory properties of olive oil. HortScience 41 (2): 427-432. Vossen, P.M., Berenguer, M.J., Grattan, S.R., Connell, J.H. and Polito, V.S. 2008. The influence of different levels of irrigation on the chemical and sensory properties of olive oil. Acta Horticulturae 791: 439-444.